While navigating to the Email Templates view – Settings, Templates, Email Templates instead of a getting a list of templates you get an Invalid Argument error message. While this could mean several different things, including an intermittent error, it most likely has to do with having two default public views configured for this entity. 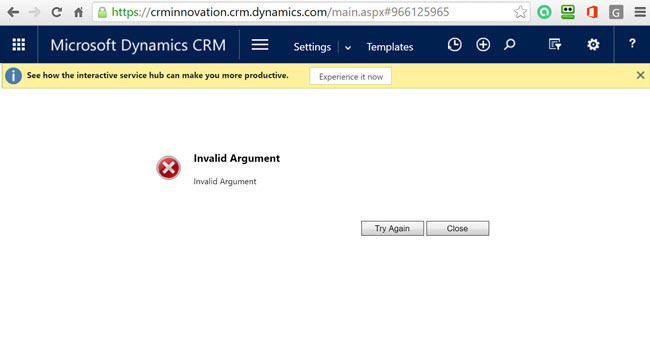 CRM gets confused and doesn’t know which one to display so it gives you an error. It can happen actually for any entity, in this case it just happened to be email templates. The underlying cause is likely from an import of a solution from a third party. To start the resolution process let’s do a little troubleshooting first to confirm that this is the issue: Navigate to Settings > Customizations > Customize the system > Expand entities, further expand Email Templates > Click on View > Do you see that there are two Default Public Views? If so proceed with the following resolution process. Publish Customizations and refresh the browser view of CRM. Then see if it works by going to Settings, Templates, Email Templates. The Default view should load! TaDa!